When 8-year-old Dorian Murray learned last month that his terminal cancer was no longer treatable, he decided he had a goal: to become famous all over the world. The Rhode Island boy has since taken social media by storm, with thousands of people across the globe posting photos and messages of support with the hashtag "#DStrong." Dorian has certainly earned that descriptor, with toughness woven into almost four years of treatment for rhabdomyosarcoma, a pediatric cancer that was diagnosed when he was 4. "The needles, the meds. Everything we have to go through. It's a lot to take," the boy told CBS affiliate WPRI. In December, after a checkup indicated cancer cells were in his spinal fluid, Dorian and his family made the decision to stop treatment just after the new year. Then, about three days ago, Dorian told his dad he had a goal. As his mom tells it, Dorian said he wanted to be famous on "the bridge in China." "He meant the Great Wall of China," Melissa Murray said. "But we knew that would be hard with the long travel and everything." So, Dorian adjusted his goal. "I'm just thinking before I go to heaven to try to be famous as much as I can," he said. What followed was a social network tidal wave. A couple of posts on Facebook, a few more on Twitter, and before his family and friends knew it, the world responded to the hashtag #DStrong. "It's like my little logo thing," Dorian explained. "You have to like stay strong for D."
Thousands have joined in the spirit of that within the past few days, from the New England Patriots' Rob Gronkowski -- who visited with Dorian earlier this week -- to strangers touched by his spirit around the world. "I've gotten Paris, Japan, Switzerland, Italy. They're just saying to keep fighting," he said. "They believe in me. And it's just really nice to know that so many people have my back for me." Given what he's been through and what lies ahead, the 8-year-old seems wise beyond his years, with a sense of humor to match. When playfully asked to confirm his age with an ID, he insisted, "I'm 8. Trust me, I am 8." "I have my birth certificate," he said, as the room of friends and family erupted with laughter. Dorian's mom and dad hope to make their son as comfortable and happy as possible in the coming weeks. 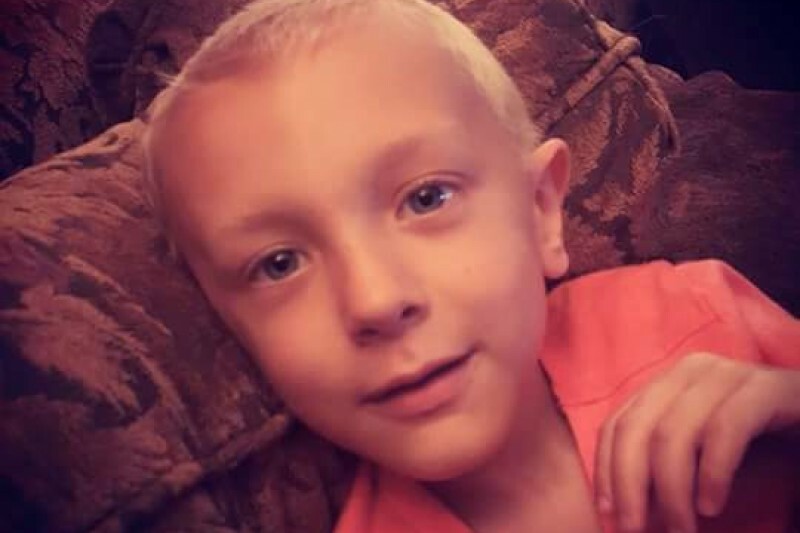 And his mom wants the world to know more about pediatric cancer, including the survival rate of about 20 percent and the need for more funding. She might some day start a foundation to get that message out there but for now, her goal is to help her son smile as much as possible as the world stands behind him. In the meantime, a GoFundMe page has been set up to help the family with medical expenses. People from all over the world are posting photos of themselves holding a sign reading #DStrong to show Dorian they are behind him and that they want to help make his wish come true.